Try this with your own figures …you may be very surprised! For many companies that I have dealings with, the management of price is diffused at best and chaotic at worst. Pricing decisions are often taken at different levels of the organisation – accountants, general managers, marketing and field salesmen – with little understanding of the true impact that changes in prices actually have on the profitability of the company. During hard times, like now, cost control becomes central to most business activity and there has been enough written about that so I will not provide anything more here. However, I have also noticed that many companies often have a collective desire to search for sales growth as an antidote to cost control and they use lower prices as the main lever to seek additional sales volumes and to ease the problems that they are having. Pricing decisions are often taken arbitrarily. They are often based on firm estimates of costs (the actual “cost” of a product is worthy of another discussion) but very uncertain estimates of the market and how people/buyers will behave. They are interfered with by managers down the line through extra concessions and discounts for certain customers. As you can see a small percentage change to the price has a much more significant impact on profitability than changes in sales volume or cost control. 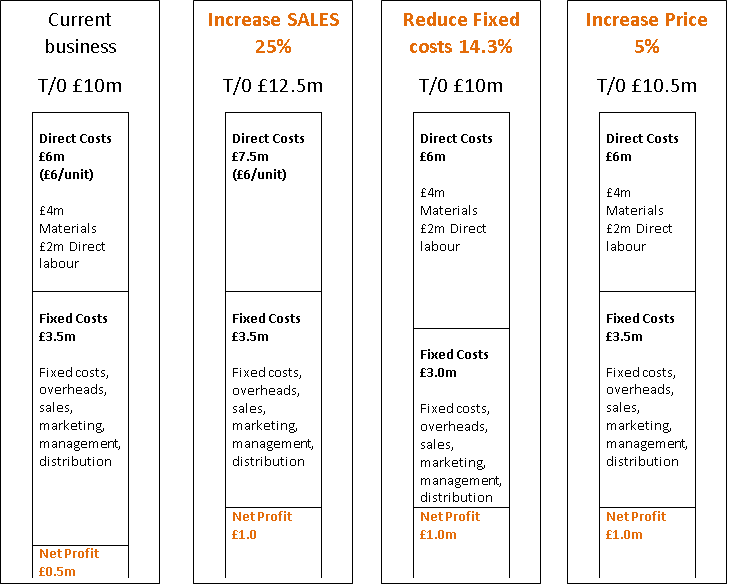 Now click here to look at the attached and see what a 5% reduction in price has on the same business if the “well meaning” increase has no effect of sales volumes or “only” increase volume by say 5% or 10%.